Revlon has introduced 4 new products to their ColorStay makeup collection, including a waterproof 2 in 1 kajal liner, luxurious crème shadow, a waterproof brow crayon, and a long-wearing brow pencil. I have always been a fan of creme eyeshadows but it’s been a while I picked up some new ones, so as soon as I spotted the new Revlon ColorStay Crème Eyeshadows in my local Target, I knew I had to get my hands on these! The new Revlon ColorStay Crème Eyeshadow is described as a luxurious, blendable and long-wearing crème eyeshadow available in 12 shades in metallic, pearl, satin and matte finishes. Each of the shadows comes with a pro-inspired built-in-brush, designed for easy, mess free application. The ColorStay Crème Eye Shadow collection has a nice mix of neutrals and soft pops of color. I saw only two mattes in there, the rest are all satin and metallic shades. I picked up 4 shades : Black Currant, Caramel, Licorice and Cherry Blossom. Texture wise, these are soft & creamy with a very lightweight barely-there feel on the lids. The formula applies and blends easily with a great color payoff (that is also easy to build up for more intensity.) It sets fairly quickly, but still gives you just enough time to blend. Not only is the Revlon ColorStay creme eyeshadow formula easy to work with, but also stays put all day without creasing all day with an eyeshadow primer. Even without an eyeshadow primer, there’s only minimal creasing and fading by the end of the day. This makes it a real find because creasing is often the biggest strike against creme eyeshadows! If you have oily eyelids like me, I suggest using an eyeshadow primer for a solid staying power. Honestly, I expected the little brush that comes along with the product to be rather useless but it actually applies the eyeshadow quite nicely, and the bristles are pretty soft too. Sometimes I need to blend the edges with my fingers but this little brush is definitely useful to have, especially during travel! And I like that it snaps easily into the cap so I won’t lose it! 740 Black Currant is a shimmery, light amethyst. It gives you a pretty pop of purple without being too bold! The color blends smoothly and there’s no shimmer fall out. I like to pair this one with the pink shade (Cherry Blossom) in the inner corner as highlight for an eye brightening look. 745 Cherry Blossom is a beautiful shimmery pink. At first, I wasn’t sure about getting this shade as it appears to have more cool undertones but I picked it up anyways and now I like it. It looks lovely as a light wash of color that brightens the lids and also as inner corner highlight. 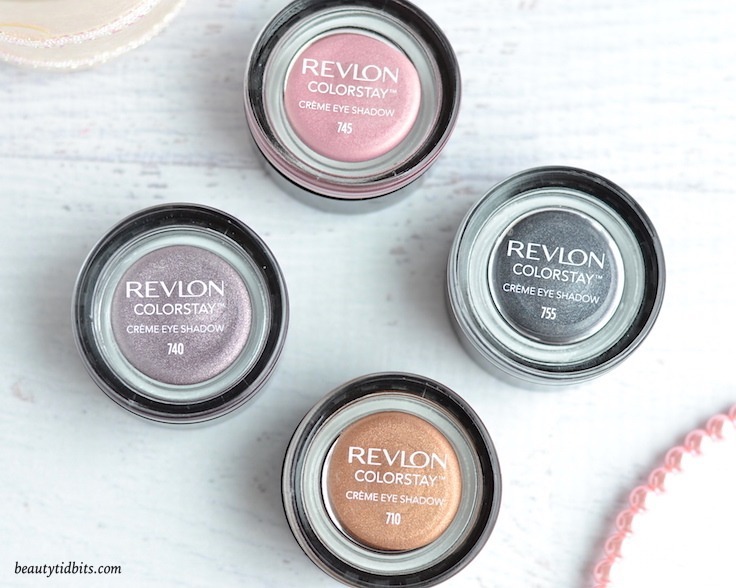 If you like cream eyeshadows, you NEED to try these new drugstore darlings from Revlon! The eyeshadow formula is top notch and the quality rivals some high-end brands. I wouldn’t hesitate saying that this is the best drugstore cream eyeshadow I’ve tried so far…not only is it well-pigmented with a silky, weightless feel but also stays crease-free all day long. Two thumbs up! Does This New Drugstore Kajal Eyeliner Stay Put On Waterline? Step Into Spring With Paul & Joe Beauté! I love these colors! They are great for springtime though they may be a little too light for my skin tone. Looking at your swatches, the pigmentation looks really good. arelaxedgal They do look kind of pastel in the pots but you can easily take the color payoff to as intense as you like!